This little guy works hard. The first few times I ran him, I was a little disappointed because the filter seemed to be full often (after approximately 15 min) and it didn't look like it was picking up very much. The bin only had a small amount of particles and very little hair. It also appeared very inefficient (circling the same small corner area for 15-20 min without moving away). However, after the first couple of tries, it runs longer (about 45 min as long as he doesn't get stuck) and definitely picks up more dust, dirt and hair. My only guess is that I have thinned the filter while trying to clean it, and that allows more airflow so it doesn't get clogged as quickly. Now, he will run almost until the battery is out of charge and the filter will be full of dust and hair when I empty it and plug him back in. For reference, I use it daily in an area that is all hardwood flooring with one area rug and a few small rugs by doorways and the kitchen sink. All of the rugs are low profile. It is an open floor plan design including the dining room, kitchen, foyer and living area, totaling approximately 1,000 sf. He can't get all of the rooms in one session, but I start him in different places each time. His weaknesses are corners (he can't get all the way back into them), rugs (sometimes he can't get over them, but when he does the suction isn't quite powerful enough to really vacuum them), and low cabinets or furniture (particularly near rugs, he tends to get pinned and comes up on 2-3 wheels). Although the low suction is not effective for the rugs, it prevents "blow back" and chasing hairballs around the room. I generally run him when I'm home, so if he gets into trouble, I just rescue him with a little nudge. Or if he gets stuck in one area, I move him to a different part of the room. We purchased this product because we have an 8-mo old Bernese mountain dog who is starting to shed like it's her job. We found ourselves vacuuming or sweeping almost every day. It was time consuming and not how we wanted to spend our evenings, particularly because she's afraid of the upright vacuum. While this product is not a complete sweeping/vacuuming substitute, it does allow longer time between cleanings and less effort during cleanings. There is a noticeable difference in the amount of time I spend with the upright vacuum: now only about once a week for 5-10 min whereas before was 2+ times a week for 15-20 min with daily sweeping. Another bonus: our Berner isn't panicky about it. While she's not friendly with him, she can stand to be in the same area while he's working and will even walk past him (as long as he's not aiming at her). She won't get within 10 ft of the upright vacuum when it is on. 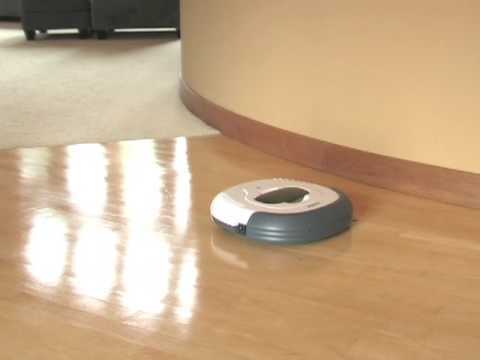 I have never owned a Roomba or any of the other high-end robotic vacuums. But this little guy is definitely worth the price, a very good value in my opinion.